Welcome to the all new Guitar Hero Songs. Your one-stop website for information on the songs featured in the world's favourite rythmn game, Guitar Hero. This site contains the lyrics of every song released under the Guitar Hero brand. Our up-to-date song lists span the Guitar Hero Series including all of the following games; Guitar Hero, Guitar Hero II, Guitar Hero III, Guitar Hero World Tour, Guitar Hero Aerosmith, Guitar Hero On Tour and Guitar Hero Rock the Eighties. 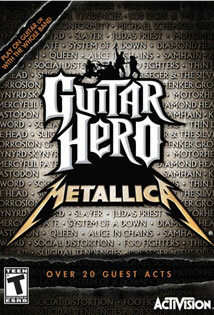 Unleash the full fury of Guitar Hero Metallica. Now you too can live the ultimate Guitar Hero dream and follow in the footsteps of rock legends Metallica as they perform their finest hits and the hits of those who influenced them along the way. The greatest smash hits from Guitar Hero I,II,II and Guitar Hero Rocks the Eighties. 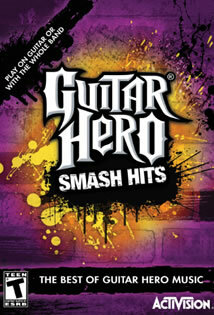 Gather your band members and prepare to command center stage as Guitar Hero Smash Hits allows you to rock out to all the greatest songs from the Guiater Hero series.